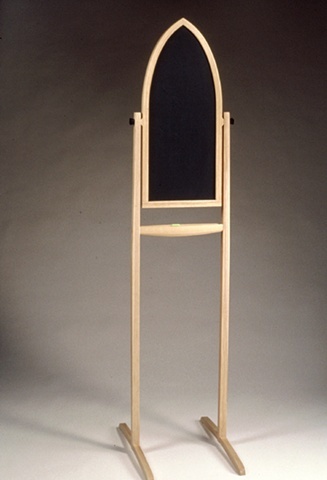 68" x 14" x 12"
"Ritual-List" is a free standing blackboard. It is a place for one to sort through all of the little lists and reminders written on scraps of paper and to manually download scattered notes onto this "mother list". "Ritual-List" is a sort of self-portrait, standing the same height as the artist and further referencing the human figure through torso and leg suggestions. This piece counts the habit of list-making as a defining human trait, and offers a place for this ritual activity. The blackboard's shape mimics that of the peaked windows of Gothic cathedrals in order to reiterate the sacred nature of the ritual of list-making. The frame is bent laminated ash, the legs and feet are connected with bridal joints, the knobs are carved from ebony, and the slate is cut by water jet.